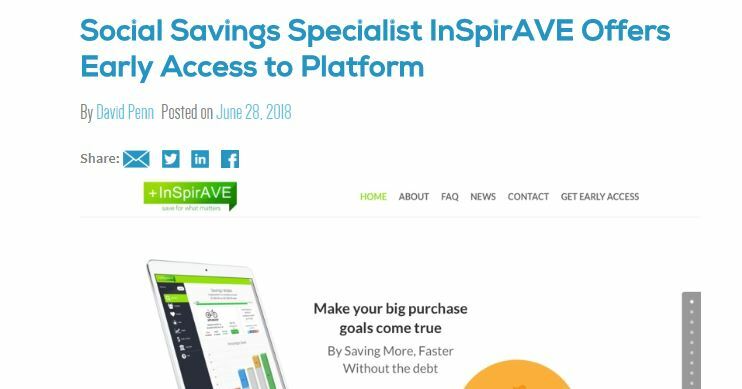 Fresh off its successful return to SXSW and a run through INV Fintech’s annual event in San Francisco, social savings innovator InSpirAVE is offering early access to its platform. The company is coming out with what founder and CEO Om Kundu calls an “entirely new look and multi-screen experience” for its app that leverages friends and family to help consumers make planned purchases by “saving more, faster” rather than succumbing to debt, fees, and impulse. The company shared a few peeks at the new user interface below. The new look embraces InSpirAVE’s social approach to making remarkably better savings and spending decisions. InSpirAVE, which has won critical acclaim from forums including American Banker and BAI, enables users to invite friends and family to comment on – and contribute to – purchases the user wants to make but cannot yet afford without credit. Connected friends and family can nudge users toward better selection decisions. Think of it as Yelp powered by friends and family who can make the path-to-purchase more personalized – and in ways that even the best product reviewers cannot. This not only enables users to avoid resorting to credit and falling into debt, but equally helps moderate impulse buying – a common source of overspending. Users can then create a tailored plan to purchase the item, using the platform to choose their desired savings completion date, establish an initial deposit, and the intelligent setup of recurring contributions. The InSpirAVE platform allows users to visualize the progress they are making toward their savings goal, including interest earned, social gifting, intelligent transfers, and any applicable discounts from the retailer. And once the requisite funds are saved, the user can purchase the item directly through the InSpirAVE platform. Kundu said that a growing number of people have signed up for early access to the InSpirAVE platform, as have a growing number of merchant partners. He pointed out that the technology transforms the retail experience into a win-win for both sides of the transaction. “Consumers get to better exercise their savings muscles to fulfill their purchase goals” while retailers and FIs “gain access to a more engaged and expanded customer base,” he explained. Kundu added that InSpirAVE’s intelligent p2p savings and commerce platform also gives merchants the benefit of greater social exposure to drive sales of their larger-ticket product-categories. Headquartered in New York and Pittsburgh, Pennsylvania, InSpirAVE demonstrated its Internet of Savings platform at FinovateFall 2016. Kundu participated in our roundtable on savingstech last spring. While the company isn’t launching the platform to the general public quite yet, it is offering early access to beta accounts on a limited basis.